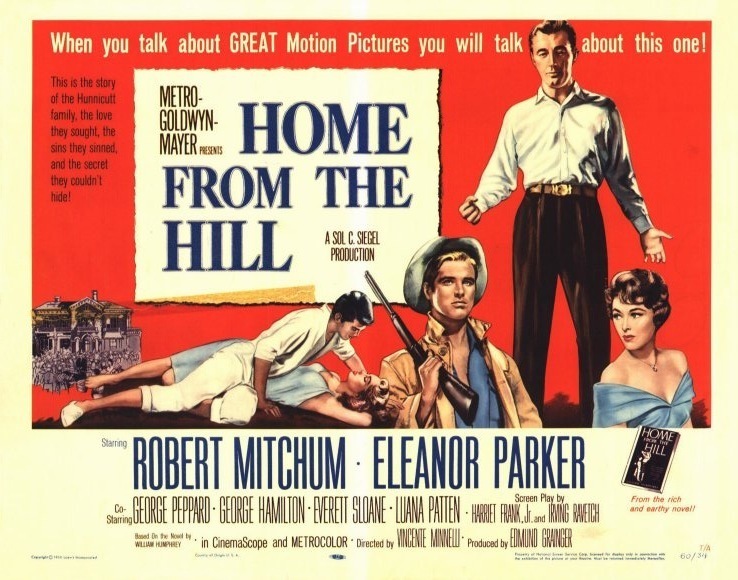 Home from the Hill – starring Robert Mitchum, Eleanor Parker and George Peppard. This 1960 MGM film takes us on a trek through the trials and tribulations of the Hunnicutt family. There is the womanizing patriarch, Captain Wade Hunnicutt (great name, played by Mitchum); His embittered and beautiful wife, Hannah Hunnicutt (Parker); strangely-naive-for-his-age son, Theron (played by George Hamilton); and Wade’s illegitimate son, whom he also employs as a farmhand, Rafe Copley (George Peppard in his dreamiest role as far as I am concerned…take that Breakfast at Tiffany’s). Very unhappily married, Wade and Hannah punish each other by pulling Theron in different directions and filling him with untruths. Fearing he will end up like his dysfunctional parents, Theron is unable and unwilling to marry the girl he loves. Theron leaves his lovely girlfriend, Libby, even though she is carrying his child. Libby is distraught and desperate for a man…any man…to make her an honest woman. Rafe steps in and saves the day with a charming drawl and a promise of devotion to her and the baby. You’d think a happy ending could be inserted here, but that would go against everything the angst has been building towards. In the tradition of all exhausting tales, there are some grave misunderstandings, a few murders, and a bittersweet ending. I have watched this movie a few times over the years and I cannot decide if I it’s the story that I like, or the way George Peppard tilts his cowboy hat on the back of his head. It’s a toss-up at this point. Either way, this film is definitely worth viewing, if only to make you feel like your life isn’t nearly as complicated as the Hunnicutt’s.